Summary: Tracking down the last of Hath-Set's mercenaries in the Andes, Hawkman and Hawkgirl smash their way to the villian's compound. While Hath-Set does his work with the bones, the mercenary commander wants to know about his money. After informing him that the money has been wired to the mercnary's Swiss account, Hath-Set disappears. The Hawks arrive, take out the last mercenary, and see where Hath-Set has gone: into a vortex generated by all of the bones of their previous lives which have been arranged into a gateway. Review: Where could a mystical gateway made out of the Hawks' bones lead to? I'm not sure if the Hawks story in Brightest Day has much to do with the events of Blackest Night or not. It seems like the other stories, except possibly the Manhunter, are following up on that series, whereas this is going it's own way. That is not a complaint. Image: Brightest Day #3, 2010, David Finch. Thanks to Shag over at Once Upon A Geek, this is the cover to the upcoming DC Adventures Hero's Handbook, from the folks who brought you Mutants And Masterminds (a pretty swank game by my estimation). Green Ronin Publishing announced today that it has signed a licensing agreement with DC Comics and will be releasing the DC ADVENTURES RPG book this August. The game is based on Green Ronin's Mutants & Masterminds, the leading super-hero RPG in the tabletop gaming world. 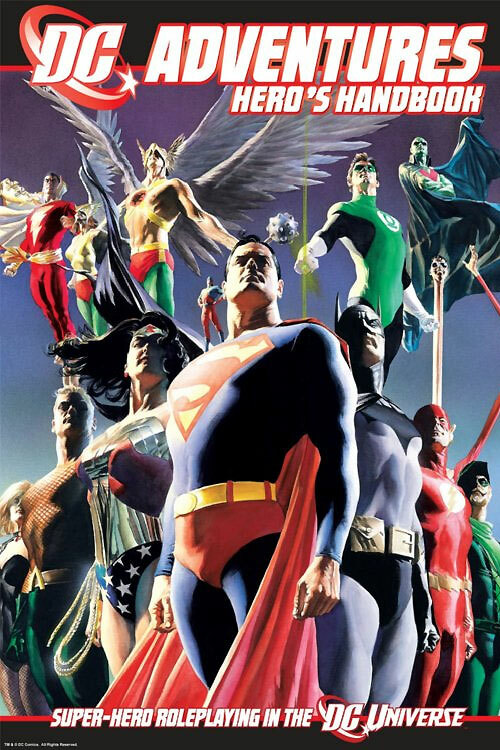 "It is DC's 75th anniversary this year and I'm delighted we can help celebrate it by bringing the DC Universe back to the roleplaying hobby," said Green Ronin President Chris Pramas. "The team-up of the DCU and the creators behind Mutants & Masterminds will create an unstoppable force of great gaming!" The DC ADVENTURES game will consist of four books, each done in full color and beautifully illustrated by top comic artists. The line launches in August with the DC ADVENTURES Hero's Handbook. Following it will be Heroes & Villains, Volume 1 in the fall. Then 2011 will see the release of Heroes & Villains, Volume 2 and DC ADVENTURES: Universe. Makes me wonder what level Hawkman is going to be! 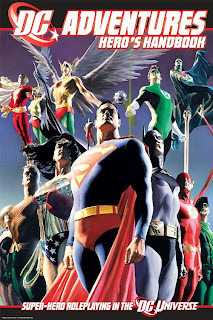 Image: DC Adventures Hero's Handbook, Alex Ross, 2010. A cursory look over the Diamond shipping lists suggests that no Hawkstuff is due out this week, so instead let's take a look at some of the more interesting DC offerings. Green Arrow #1 -- This relaunch has sort of sputtered out. I think a good portion of that is that the old Green Arrow book ended a few months back and Rise of Arsenal has not been all that great. That said, this new direction for the Number One Frenemy of Hawkman looks like it might be worth checking out. Superman #700/Supergirl #53 -- The first two of the post-New Krypton Superbooks (with Action coming next week) should give us an idea of what we can expect going forward for the titles. Superman has gotten a ton of hype thanks to JMS, who launches his story about Superman walking across America (except, apparently, the South), while Supergirl has had some very intiguing covers solicited. Zatanna #2 -- I picked up #1 on a recommendation from the boys over at the Alternate Reality podcast and enjoyed it. I like how Dini has defined a role for Zee -- as the ambassador of magic to the mortal realm -- while also establishing the beginnings of a Rogues Gallery for her as well. This past Saturday my family and I took a day trip to Columbia, including a stop-off at Heroes & Dragons! And if I go to a comic shop I haven't been to in years, you know I am going to try to score some Hawkstuff! Hawkworld -- After the giant haul of this I got at that Charlotte mini-con a while back plus pulling the miniseries out of a 3/$1.00 bin, I don't have much left to get. After this trip there's even less, as I added #11-13, 24, 27-28, and 31-32. Four more issues (including an Annual) and Hawkworld is complete. Volume 3 -- I actually have the entire run of the third volume of Hawkman, but I am missing some crossover issues, including the three I picked up, namely, Guy Gardner: Warrior #32-34. This leaves me with the two JLA crossover issues to finish all of this run. Volume 4 -- I have most of this run, but after you get to issue #25 my collection gets a little spotty. I added the Secret Files and Origins special, plus four issues after the title changed to Hawkgirl: #46, 49, 56, and 61. Adama actually has the fourth trade from this run for me but I forgot to actually get it from him when I saw him this weekend (doh!) but beyond that I have seven issues left to finish this run up. A nice dent for sure. I am starting to really finish up some more volumes, which means that sooner or later I am going to have to start looking into the harder to find stuff, including those World's Finest and Detective backups! But for now I can bask in the glow of new (to me) Hakwman comic books. IGN Comics: So let's jump in and talk about the cast and get your insight into these characters, why they appeal to you, and where they stand in these early stages of Brightest Day. We'll start with Hawkman and Hawkgirl. 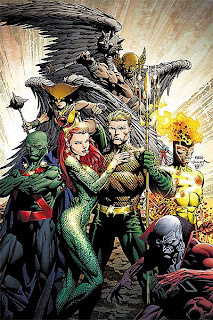 You've been involved in overhauling these characters earlier in your career in the JSA and Hawkman series. What's your take on the characters, and what do you think makes them special? Johns: Pete and I really see the Hawks – and we worked on the Hawks for a long time – as reincarnated warriors. They're two of the greatest fighters in the DC Universe because they've had thousands of years' worth of experience. In addition, their passion for one another and for life can't be destroyed – death can't even stop it. I find that, in a strange way, really romantic. It's a very appealing trait. Everything they do, they do out of love, as barbaric as it may appear sometimes. IGN Comics: And there's that tragic inevitability behind the idea that every time they come together it leads to doom. Johns: Right. That's exactly what is at the forefront of their story in Brightest Day. It's about them dealing with that curse and that adversity, wondering how long they're back for. This is not good for them. IGN Comics: It was teased in Blackest Night, and we've seen a little bit in Brightest Day, regarding the idea that the two of them are connected to the Star Sapphire/Zamaron force. Was that a natural fit that popped up in the writing of Blackest Night? Johns: We were thinking about where the greatest, boldest love comes from in the DC Universe, and the Hawks immediately came to mind. Very interesting stuff! Be sure to check out the rest of the interview to see what Johns has to say about the rest of the Brightest Day crew. 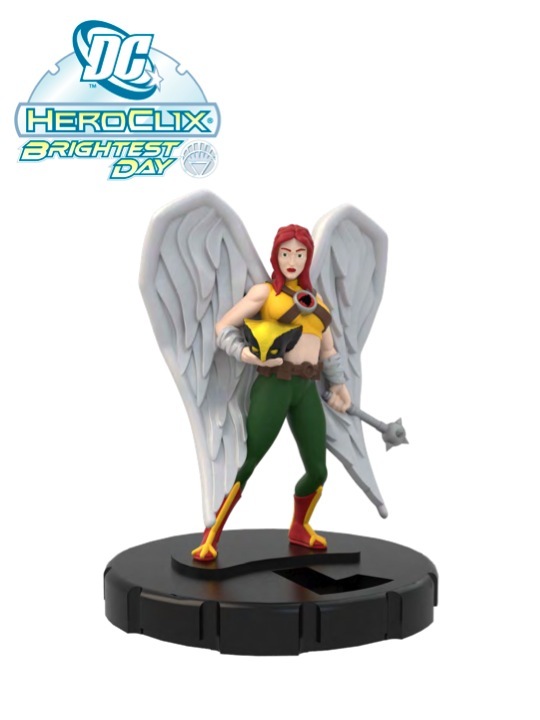 Wizkids Games, purveyors of the collectible minatures game Heroclix, has released some preview images of their upcoming Brightest Day set, with Clix based off of the stars of the maxi-series. Here we see the preview of Shiera Hall, the "new" Hawkgirl. Well, I have to say that this is a pretty nice looking miniature. I don't play Heroclix myself but I like how the mini calls back to the scene from Blackest Night #8 when Hawkgirl doffs her helmet. And the mace is always welcome as well. I wonder if there will be a Hawkman as well? Image: Heroclix Hawkgirl, 2010, image retrieved from Newsarama. From DC's The Source blog, here is a preview of the cover to Brightest Day #5 by David Finch, featuring the Winged Wonders Hawkman and Hawkgirl, who look like they are chasing the TARDIS or something. Nice dynamic "comin' at ya!" type of cover. The only complaint I really have is that Shiera's new costume, with the straps, really makes a point of emphasizing her bust, while he old costume was sleeker and more elegant. I am also not thrilled with the belly shirt but what can you do? Brightest Day #5 is due out in two weeks. Image: Brightest Day #5, 2010, David Finch. Can you believe it's halfway through June already? Yikes! Let's take a look at what sort of Hawkman stuff we can expect to see in the comic shops today. Brightest Day #4 -- Hopefully #4 should be in stock at my shop today, since I know I finally at least have #3 sitting in my pullbox. I have done my best to dutifully avoid spoilers for #3 so I will have a sort of double-sized issue of Brightest Day to enjoy, heh. DC Universe: Legacies #2 -- Hawkman cameoed in the first issue, which focused more on the Atom, Sandman, Spectre, and Dr. Fate, but he may crop up in here as we continue our focus on the Golden Age of the DCU. Well, I finally had a chance the weekend before last to open up some of the toys I had accumulating in my house, including the DC Universe Classics Hawkman. The first thing which strikes me about this toy is the musculature and bulk. This is a powerful rendition of the Winged Wonder! Definitely taking a modern approach in the sculpting. The costume takes a sort of mixed approach, with the modern taloned boots but a more Silver Age look of clean lines everywhere else. The helmet is suitably streamlined but still nicely sized. The orange color is a fun callback to the old Super Powers toy, I think. The wings are very striking. Each feather is sculpted and painted individually, really helping them to stand out. 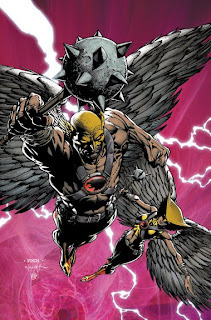 The pair stands just slightly shorter than the top of Hawkman's helmet, and the wings themselves are on a hinge, allowing a solid range of "flapping" motion. Furthermore, each wing has a second segment connected on a swivel, which allows him to be posed either in a standing pose or a soaring one. Our hero is armed with some nice accessories as well, in the form of a mace, shield, and sword. The mace has a sadly non-functioning wrist loop, but still looks imposing in Hawkman's hands. The shield is a buckler-type, and clips easily onto either of his wrists. The sword is a nice little addition. It's about the size and shape of a gladiator's short sword, and the designers were nice enough to include a loop on his belt to store it. The major aspect I don't like about this figure is the hinge joint for the wings, which just looks ugly. Its functional and holds the wings in place very nicely, but that doesn't mean it doesn't stick out like a sore thumb! All in all this is a very nice representation of Hawkman and will look very handsome standing with his brethren on the shelf! Today we are finally finishing up a series of Joe Kubert original art pages from Flash Comics #97! You can find the previous installments here, here, here, and here! In the final page of art (which is page 7 of the story), Hawkman has devised a plan to stop the Muans plan and defeat them, shooting a signal rocket filled with "hypo-salt" into the atmosphere. As the Muans attempt to feed a victim into their device, Hawkman leads them on a chase, as the ostensibly hypo-salt-infused rain begins to pour down on them. I really like how Hawkman looks in the first panel, all trim muscle. Unfortunately that second to last panel is very awkward looking, though the final shot of Hawkman fighting the goons is nice. I would like to know where Hawkgirl is but I guess something happened to her in the two intermezzo panels! I want to give a big thanks to Doug Zawisza, author of the Hawkman Companion for TwoMorrows and curator of the Doom Patrol blog, who hooked me up with these images last year. Sorry it took so long to get them all run but now everyone can enjoy them! In something of a comedy of errors, Diamond once again did not ship Brightest Day #3 to my LCS this week, meaning that at best I will get #3 and #4 on the same day next Wednesday. So, sorry to say but once more your review of BD #3 will have to put on hold. Very frustrating! The Comic Reader was a long-running fanzine which was put out by Street Enterprises for most of the 1960s and 70s. A little before my time, but I am pretty sure I have come across them here and there at shows. 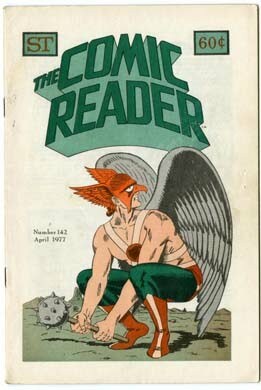 Anyways, this is the cover to issue #142, featuring the Winged Wonder picking up his weapon of choice. I am not sure who the artist is... anyone have any thoughts? Sorry about the lack of posts and post quality lately... been really stretched thin over a rough patch. Hopefully things will even out in a little while. Image: The Comic Reader #142, 1977, ?? ?, image retrieved from eBay. Sorry folks, my LCS didn't receive almost half of their comics last week, so no review of Brightest Day #3 today. However I will try to get a post up this afternoon, and then review the third issue later in the week (assuming they got the balance of their order!). Sorry for the inconvenience! Well, we all weathered our delay, so now we have to ask what Hawk-related stuff can we expect to see in the shops on Thursday? Brightest Day #3 -- Hawkman and Hawkgirl have a new mission: to hunt down and kill Hath-Set before he kills them and keeps the curse alive. Sounds like a good idea, right? Hopefully this issue will have more Hawk stuff than the last issue, but I am totally buying this series anyway so I'll probably be happy anyway. Comics are delayed a day this week in the US thanks to the holiday on Monday, but to tide us all over here is a preview of Brightest Day #3 over at DC's Source blog. Enjoy!